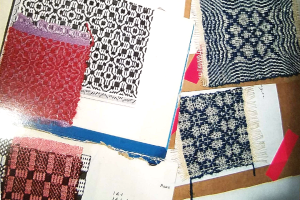 Spend the day weaving different overshot patterns on set-up looms with expert Freda Peisley. You will take home the samples you weave, the paperwork for the pattern, and the inspiration to weave on your own. Please bring your lunch. This class will take place on Fri, May 24 and Sat, May 25, 10 am-3 pm each day. You may attend one or both sessions and it costs $65 for each day and includes one sample per day ($130 for the weekend). This workshop will be held at the Alling Coverlet Museum, 122 William St., Palmyra. Interested individuals can register online, in-person at the museum office, or by phone. Freda Peisley started weaving at age 8. She studied textiles in college and has been weaving and spinning ever since. She demonstrated and taught children and adults weaving, spinning, and dyeing with natural dyes at the Genesee Country Museum for 40 years. As a member of the Weavers' Guild of Rochester, Freda participates as a docent in the Alling Coverlet Museum. Beyond being a knowledgeable and frequent docent, she has also performed demonstrations and workshops for the museums including an indigo dyeing demonstration and a crazy quilt pillow workshop.